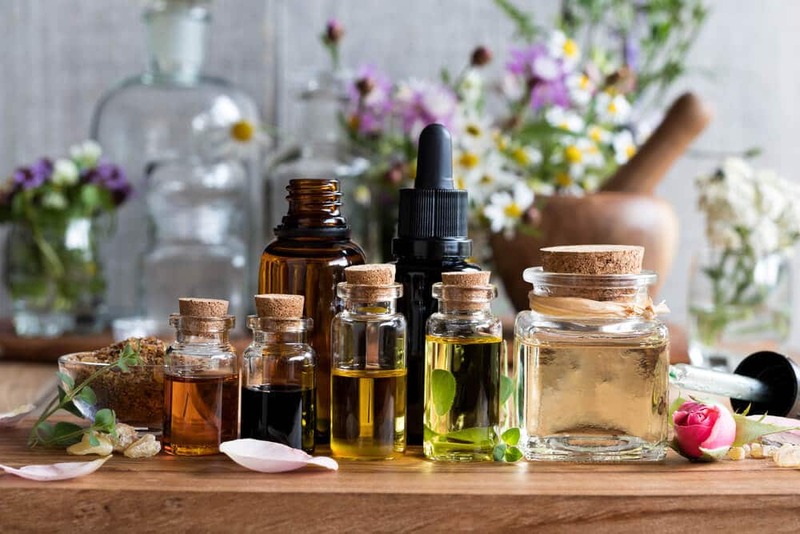 Essential oils are a natural remedy that go back as far as Ancient Egypt, where people used the scents of these healing oils in everyday life as early as 4500 BCE. There are even 188 references to essential oils in the Bible. Essential oils, believe it or not, are not actually oils. They’re a form of highly concentrated plant extract which has a variety of traditional uses. In fact, it can take up to 2,200 pounds of orange blossom to make just two pounds of Neroli oil. Because they are so rich, a little can go a long way, and this has definitely contributed to their rising popularity as an alternative medicine and therapy. These compounds are used by the plant to help them be more resistant to disease and have a wide variety of uses for humans. Theories about how these oils work on the body are bountiful. Essential oils contain oxygen and may help to carry that oxygen into the body to fight nutrient deficiency. Some essential oils also contain powerful antioxidants which fight free radicals and cell degeneration. 1 How Are Essential Oils Used? 5 Which Essential Oils Are Best for Anxiety? 6 Which Essential Oils Are Best for Sleep? 8 Which Essential Oils Can Be Toxic to Pets? One of the most traditional uses of essential oils is as a form of aromatherapy. Some people do this by spritzing an oil blend on to soft furnishings from a spray bottle or adding a few drops to their laundry. Diffusers have become a popular method of using essential oils as aromatherapy in the home. There are two types of diffuser- active diffusers and passive diffusers. Passive diffusers use steam to spread the scent of the essential oil throughout the home like mist. Active diffusers spread this steam into the air as well as actual droplets of the essential oil. Be careful, as some essential oils can cause problems for pets and small children when diffused like this, with passive diffusers being the safer and gentler of the two. If you don’t want to buy a diffuser, there are other ways to use essential oils for aromatherapy. Putting a few drops of lavender oil on your pillowcase can help induce a peaceful night’s sleep, while mixing a few drops of rose oil into a hot bath is uplifting and relaxing. For clearing sinuses, an old trick is to mix a few drops of a medicinal essential oil, like eucalyptus or peppermint, into hot water and to inhale the refreshing steam. Many essential oils can also be applied topically. Because they are so concentrated, they are usually diluted with a carrier oil. Only a few drops of wintergreen oil are required to massage a sore joint, and anything more could be too strong. Mixing with a carrier oil helps make these powerful remedies go further. Carrier oils are usually vegetable or nut oils such as almond oil or coconut oil. If you’re mixing essential oils as a remedy for your skin, it’s a good idea to research the best carrier oil for your skin type. Ingesting essential oils has become much more popular in recent years, with many people sharing essential oils based on cookbooks and recipes. As these extracts are very strong, this method should be used with caution. Make sure your essential oils are certified safe for internal use and use them sparingly. And remember, these oils have powerful medicinal properties. Treat them like medication and don’t give them to pets. Now you know all about what essential oils are and how to use them, let’s find out what they can do. Essential oils have been traditionally used as herbal remedies for a variety of common illnesses. Here are some of the most powerful oils for cough and cold symptoms. Thyme: Thyme is both antibacterial and antiviral. Apply thyme essential oil topically by rubbing a few drops on the chest, or use aromatherapy by mixing with hot water and inhaling the steam. Caution: Thyme oil is toxic to pets. Ginger: Ginger oil is gently warming and helps to clear mucus. Apply topically by rubbing a few drops on the chest for coughs and colds, or onto aching joints to ease pain. You can also add one drop to green tea daily to help fight sickness. Teatree: Teatree oil has amazing antiviral properties and helps to ease congestion. Apply topically to the chest or inhale the steam for coughs and colds. Caution: Teatree oil is toxic to pets and should never be taken internally. Lemon: Lemon oil is a natural disinfectant with anti-viral properties. It boosts the immune system and helps to clear mucus and phlegm. It can be diffused or applied topically, but caution should be exercised around pets and small children. Eucalyptus and Peppermint: These oils are detoxifying. They help to clear mucus and can relieve sinusitis when used aromatically. Peppermint oil also soothes aching joints and relaxes muscles when applied topically. Wintergreen: Wintergreen oil is a potent essential oil which eases swelling and inflammation. Caution: it is toxic to pets and should never be taken internally. Frankincense: Frankincense oil eases joint pain. Diffuse this oil for its relaxing aroma or rub topically on to achy joints. Turmeric: Turmeric oil is a powerful anti-inflammatory, especially when applied topically. Caution: Turmeric oil can easily stain soft furnishings. Lime: Lime oil is antibacterial, antiseptic and antiviral, making it great for sore throats. It can be applied topically to the throat or drops can be placed under the tongue. Cardamom: Cardamom oil is warming and clears congestion. It can be applied diluted to the chest to soothe a sore throat. Caution: do not use on young children. Cinnamon bark: Cinnamon bark oil offers immune support and can ease sore throats. One drop is great added to a traditional honey and lemon beverage. Some essential oils have incredible skin healing benefits, thanks to their moisturizing and antibacterial properties. To get the most out of them, these oils can be mixed with your chosen carrier oil and applied directly to the skin. Patchouli: Patchouli oil can improve dry, cracked skin. It can be diluted with a carrier oil and applied topically or added to face lotions. Jasmine: Jasmine oil is anti-inflammatory and calms irritation. Apply topically by adding 1-3 drops to lotion. Lavender: Lavender oil repairs dry, cracked skin when applied topically, especially with a carrier oil. Almond: Almond oil is the carrier oil of choice for dry skin and reduces inflammation, even on its own. Teatree: Teatree is antibacterial and is great for treating acne and small cuts. Apply topically with a carrier oil for larger areas, or on its own for dabbing on to blemishes to heal acne. Caution: Teatree oil is toxic to pets and should never be ingested. Geranium: Geranium oil can promote clear skin when diluted and applied topically. Green tea: Green tea oil purifies the skin when diluted and applied topically. It also helps to reduce dandruff and calms itchy scalps. Rose: Rose oil is said to promote a healthy complexion when diluted and applied topically. Tangerine: Tangerine oil accelerates skin healing and fights off bacteria. Using essential oils can be the perfect remedy when you’re feeling tired and low on motivation. For increasing energy, aromatherapy is the best way to enjoy them. Diffuse these scents in your home for an energy boost. Citrus: Citrus is incredibly energizing and is perfect for the morning. Sweet orange is said to be the most uplifting. Frankincense: Frankincense helps to clear the mind and improve focus. Peppermint: Renowned for improving concentration and sharpening the mind. Cedarwood: This warm and comforting scent is said to improve focus. Eucalyptus: Eucalyptus is said to soothe and clear the mind. Ginger oil: This warm and zesty scent is said to both energize, and to soothe and comfort. Pine oil and Rosemary: Both of these scents have an invigorating and refreshing aroma. Which Essential Oils Are Best for Anxiety? Essential oils can be powerful for lifting mood and treating problems such as depression and anxiety. This is most effective when used aromatically, such as through a diffuser. Lavender: Lavender is renowned as one of the most relaxing of all scents. Diffuse this scent in your home to reduce stress and anxiety and to promote a healthy night’s sleep. Rose: Rose is also widely known for promoting peace and relaxation. Bergamot: Despite being an energizing citrus aroma, bergamot is said by many to help relieve stress and awaken the senses. Jasmine: Diffusing the aroma of jasmine reduces anxiety. It uplifts your mood and enhances self-confidence. Cedarwood: The aroma of cedarwood brings feelings of wellness and vitality. Frankincense: Frankincense is an ancient aroma used to reduce stress. Sage: Sage oil has been said to clear the mind and to help clear negative energy from a space. Ylang ylang: Literally translating as “the flower of all flowers”, it’s no wonder this scent has been long prized for it’s relaxing and uplifting floral scents. Essential oils can work wonders for beating insomnia and catching up on that beauty sleep. For the best results, diffuse these oils in the home or put a few drops on your pillowcase before you go to bed. Here are the best essential oils for a good night’s sleep. Lavender: Lavender oil is relaxing and regenerative. It is said to be the best essential oil for promoting relaxation and a good night’s sleep. Vetiver: Distilled from vetiver roots, this strong and earthy scent is great for sleep. Marjoram: Marjoram is great for aiding a good night’s sleep, and also for soothing aching muscles. Roman Chamomile: This floral scent promotes peace and relaxation. Valerian: Valerian is an age-old remedy for insomnia, and traditionally the roots of the plant are boiled into tea. Valerian essential oil is used to aid a healthy night’s sleep. Geranium: Geranium oil can reduce stress and also has a sedative effect. Both citronella and lavender have awesome insect repelling properties. Diffusing these scents around your home are sure to help keep the bugs at bay. Lemongrass, citronella, lemon and marigold keep away mosquitoes, while cedarwood, tea tree and eucalyptus can protect against fleas and head lice. To repel ticks, try juniper or thyme. Only around 10% of plants have been used for essential oils so far, and every year more are discovered which could have therapeutic purposes. Used safely and correctly, essential oils open up a whole new world of holistic healing for the mind and body. Which Essential Oils Can Be Toxic to Pets? Some essential oils can be toxic to pets. Here is a list of essential oils that have been said to cause reactions in some pets. Read this list to make sure you’re using essential oils safely around your furry friends, and if you’re not sure then ask your vet. If you’re worried your pet might have ingested essential oils, the signs to look out for include drooling, wobbliness, vomiting, and respiratory distress. Some have been harvested to near extinction. If you want to make sure you’re not using oils from an endangered plant, you can do that here. If you want to indulge yourself with essential oils, visit OilyHQ.